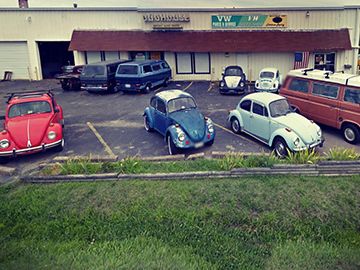 The Bughouse has been serving Virginia Beach’s VW community since 1983. The Bughouse is the leading supplier of quality parts and service for Volkswagens and other imports in the Virginia Beach area.We stock more VW parts than any store in the area and have a supply of used parts too. Along with the store we are a full service garage and body shop, offering everything from tune-up and valve adjustment to complete restoration and high performance custom engines. While The Bughouse has been around for more than 30 years, TheBughouse.com is just beginning. Much like when Frank opened his store in Virginia Beach in 1983 and filled a need for VW parts in the area, TheBughouse.com hopes to fill a need for an east coast supplier of quality parts along with the expertise that 3 decades in the business brings. You can be sure that parts sold through our web site are also sold in our local store and are used by our mechanics for local customers. The parts and accessories we sell and the manufacturer that make them are tried and true. You can also contact us for help with any part you purchase from us. Our hope is to provide on the Internet the same good customer service and expertise that we have provided for our customers locally for many years. 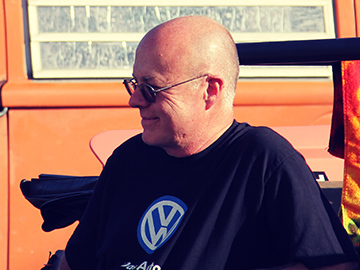 Frank, Owner & Lifelong VW Enthusiast. Frank Yaconiello founded The Bughouse in Virginia Beach in 1983 originally to provide a stock of parts and supplies for Volkswagens and other imports to support area garages, primarily Rudy’s Tidewater Automotive and Electrical. Soon the demand from individual enthusiasts helped him outgrow the space he shared with Rudy on Virginia Beach Blvd. and Witchduck Rd. The expanding need for good quality parts and then parts and service caused him to move a few times to the place he is now, just a few blocks from his beginning but bigger than ever.